This last couple of months at Discovery have had us get to meet a lot of new students. We of course are excited to see the school grow, but the majority of our excitement is in getting to share a martial art that we love. That’s the best part of teaching for me, and I see it in the enthusiasm of other instructors as well. Photo courtesy of Brinkley and Co. When the everyday person thinks about belts in martial arts, they will often picture the black belt, which signifies a high degree of mastery and knowledge in an art’s techniques. 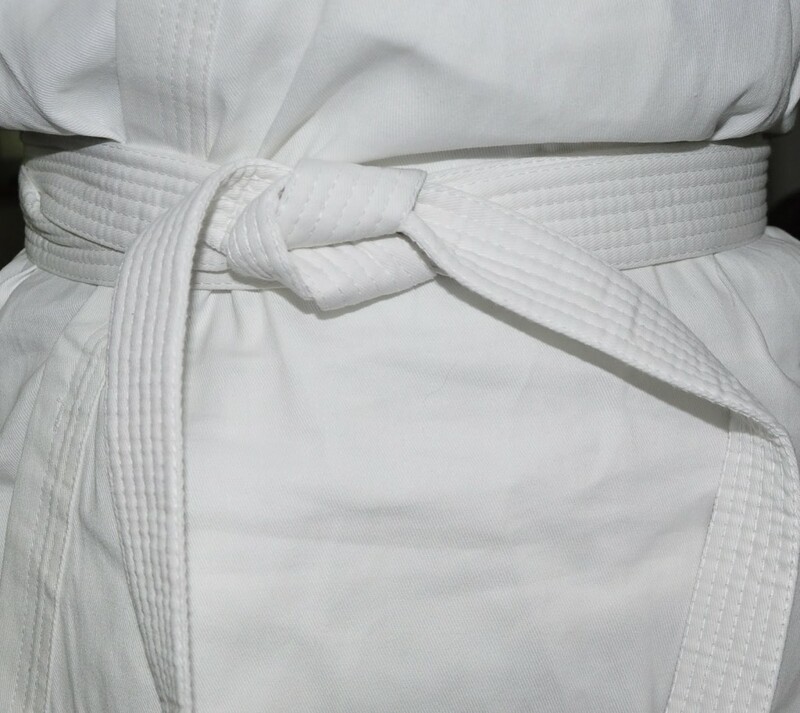 We see it as an important, but not as important as the white belt. This is because without your white belt, no other belt can ever happen. 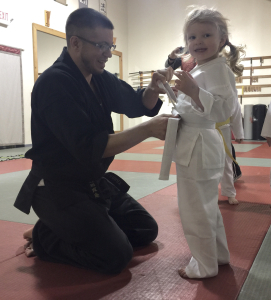 Often, the steps to becoming a white belt are pretty significant. Almost everyone I’ve ever spoken to is interested in training, but doesn’t for some reason; everything from logistical concerns to the fear of being judged stop people from ever pursuing the martial arts. For those who’ve found a way past those roadblocks and have made it in, congratulations! The next part of this article is for you. When you start at a martial arts school, you are jumping into an entirely different culture. Even two schools that study the same art can be vastly different in terms of instruction style, student culture, tradition adherence, and more. There are a few simple things as a white belt that you can remember to amplify your earning experience and build your relationship with other students in the school. There is nothing to prove. We know that when you start in a new art, you don’t know much about it. Every person wearing an advanced belt has struggled with so many techniques and situations that it becomes humbling. Many new students want to impress the instructors and students, and so will try very hard to make a technique succeed; too much early emphasis on speed and strength, and not enough body movement tends to lead to frustration, failure, and risks injury. Remember, your instructors and your training partners are happy to see you coming in, so you can relax and have some fun! While we train in a serious art, it is important to not take yourself too seriously. Ask questions often. There is a lot going on underneath the surface of technical training. Asking questions is a great way to come to understand techniques and concepts more deeply and quickly. Even a simple “why would I do this?” is a valuable question. We encourage our students to be curious about what they’re learning. The most valuable techniques are tested ones, and questioning a technique is the first step to testing it. Find a partner. Chances are, there is someone else who is starting or has recently started who is just as enthusiastic as you. Finding a partner or two to practice with or talk to outside of classes not only helps you grow as an artist faster, but it fosters a supportive community in the school. It benefits you in so many ways to go ahead and make a friend in training. I can personally think of a few training friends I’ve made over the years, and they were very influential in helping me become the martial artist I am today. Focus on your own learning. New students who have been around for a couple of weeks or months are excited and want to help their training partners. That’s a great thing! When a new student comes in, I oftentimes see very new students trying to teach a technique. I respect the thought here, and since you’re new you have to remember that you probably a limited grasp of the technique. You may lead your partner down an incorrect path! If you want to be helpful, direct new students to an instructor if you both have highlighted an issue. That way, you benefit from the instructor coaching your partner! Focus on developing yourself in the beginning; there’s nothing wrong with being a bit selfish here! Read. There are many books out there for every martial art. Learning more about martial culture, an art’s history, or about high level artists enriches the experience, and adds to your knowledge base. It ‘s important to grasp the concepts of an art and why it exists, which we try to communicate through training over time. Reading imparts important knowledge, which will help you ask better questions over time. Most importantly… have fun! Martial arts is more than learning about fighting. It’s a bout learning how to live. We want our students to live peaceful, happy, and purposeful lives. Martial arts training gives you a chance to learn some really great skills while improving your health, physicality, emotional well being, and much more. We no longer live in the feudal era, so relax! The next time you are struggling with learning a new throw, or just can’t seem to remember a technique in the middle of a demonstration, it’s okay. Remember, this is all about learning new things and developing yourself as a person. Taking on martial arts can be a bit daunting, and it’s important to keep the above suggestions in mind as you start on your martial journey, no matter what style you intend to learn. Whether you’re a new student or thinking about becoming one, think on these things well.